With Easter only a week away I thought an Easter-themed :make: post might be in order! 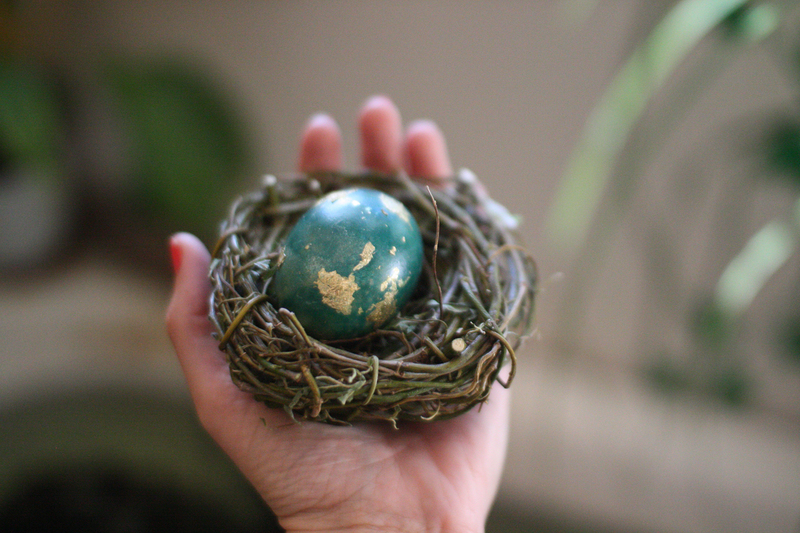 I made these gold speckled eggs for my Easter display at Mr Sparrow and they’re very easy to do. Boil the eggs for 10 minutes or long enough to ensure they’re thoroughly hard-boiled. Alternatively, you could blow out the eggs, which is a bit more time-consuming but means you can keep them for future Easters (hard-boiled eggs will start to smell after a few months). Prepare a dye-bath by mixing food colouring of your choice with vinegar and enough hot water to cover the eggs. You will usually find instructions on how much dye and vinegar to use on the packet of food colouring, but as a general guide you’ll need around 1 teaspoon of vinegar and about 20 drops of colouring for each cup of water. For these turquoise-green eggs I used a mix of blue and yellow colouring. 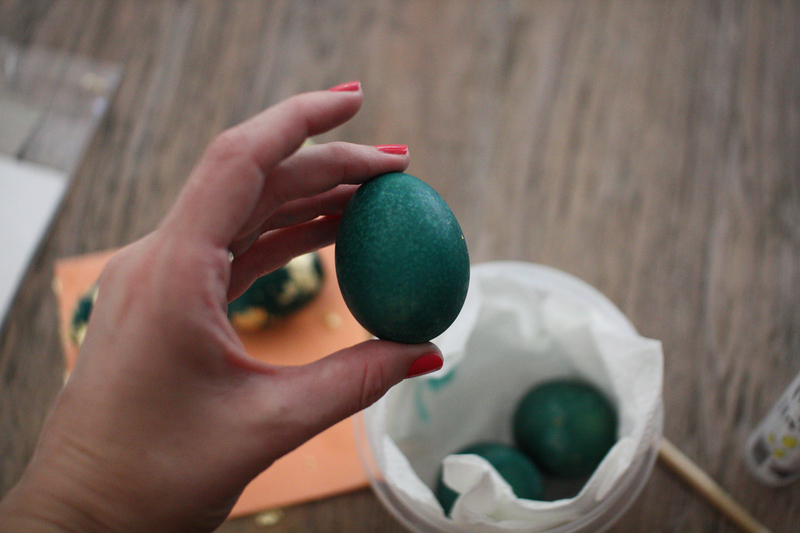 Leave the eggs in the dye overnight if possible to achieve a really nice, deep colour. 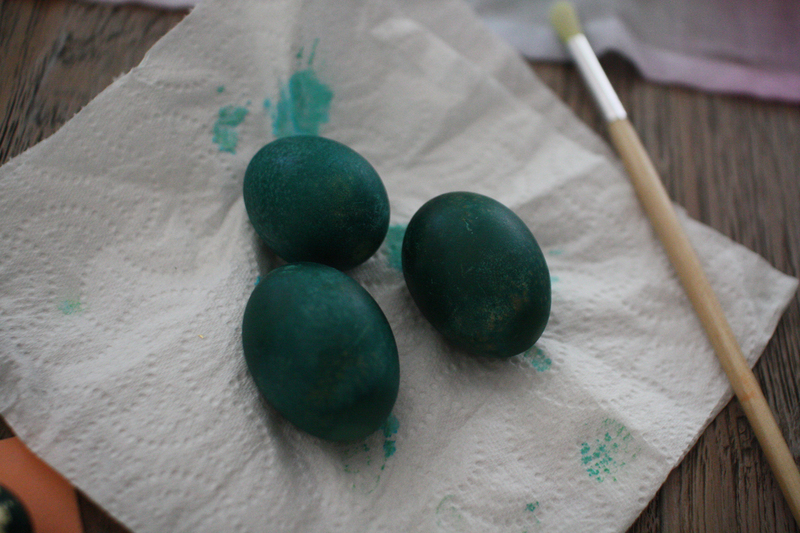 Remove the eggs from the dye with a slotted spoon and leave to dry on paper towel. Once they’re dry you can start to add your gold specks. 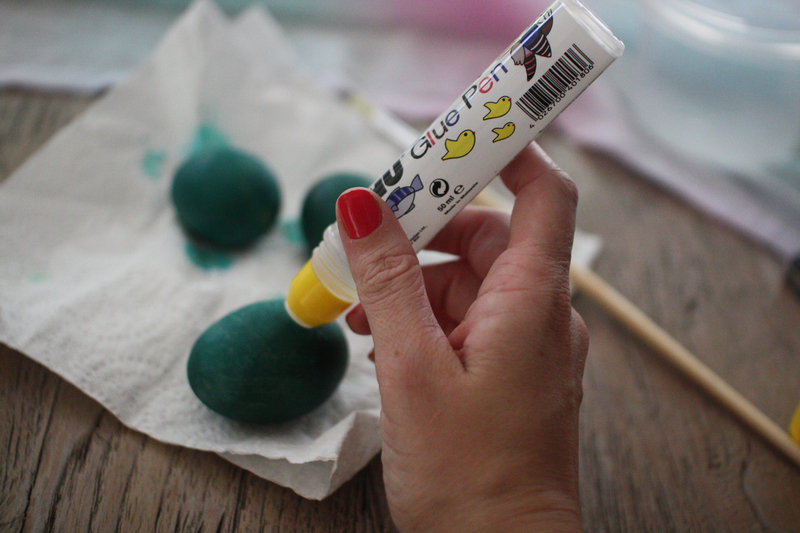 Use your glue pen to mark dots or patches on the egg’s surface. You can be as uniform or as crazy as you like! 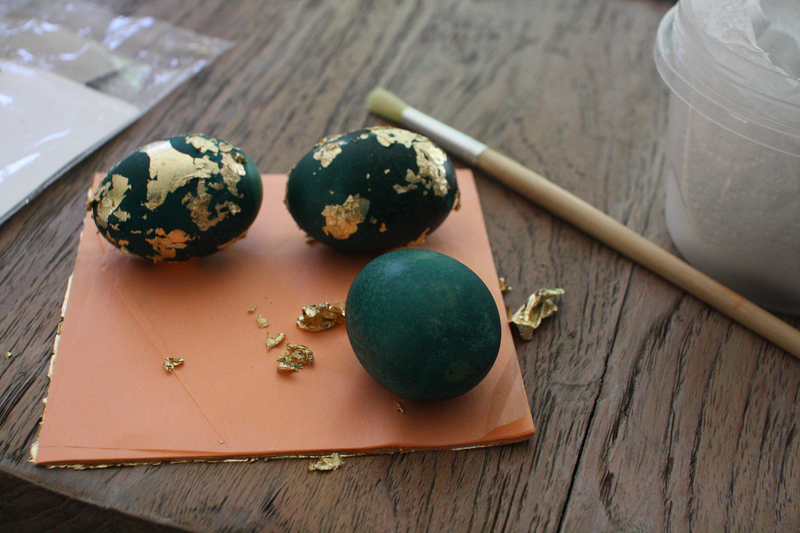 Take a sheet of gold leaf and tear off pieces, then apply these to the glue dots on your egg using your fingers. Brush off the loose bits of gold leaf with your paintbrush. 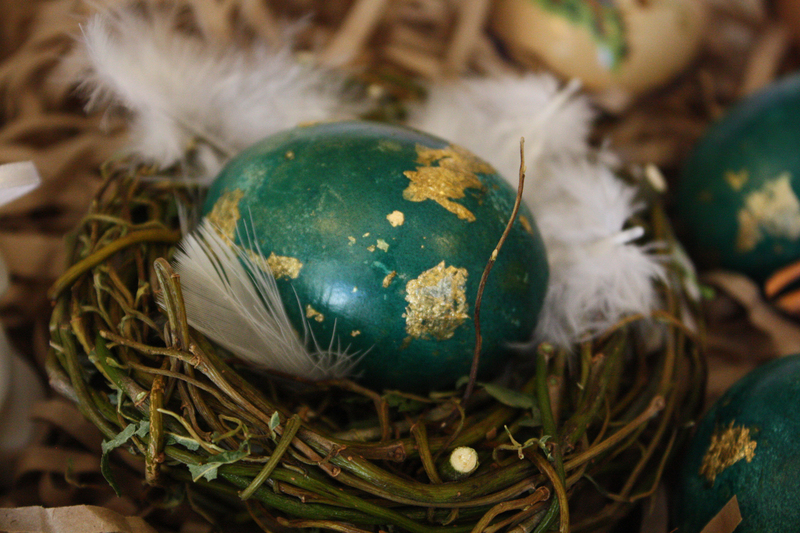 Because of the way the gold leaf sticks to the eggs, the “dots” won’t end up looking like clear dots, but more like a general speckledy pattern. 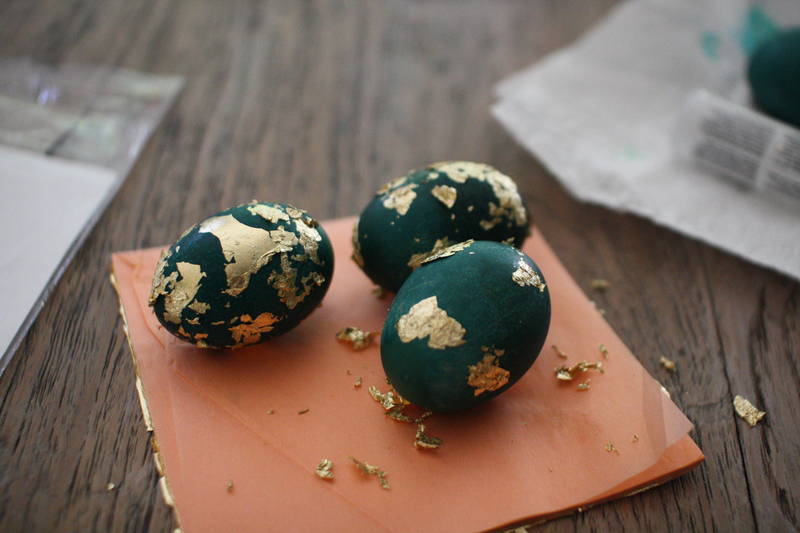 If you want more gold on your eggs, apply the glue dots in the same way but then take a whole sheet of gold leaf and wrap it around the egg. Use your paintbrush to brush off the loose bits of gold leaf – you’ll find more gold leaf sticks this way than by applying it to each dot individually. Protect your eggs by finishing them in a coat of clear varnish – I use this one by Jo Sonja. Display the speckled eggs on your Easter table or give as a little Easter gift! 29 Mar	This entry was published on March 29, 2012 at 6:38 am. It’s filed under make and tagged make. Bookmark the permalink. Follow any comments here with the RSS feed for this post.